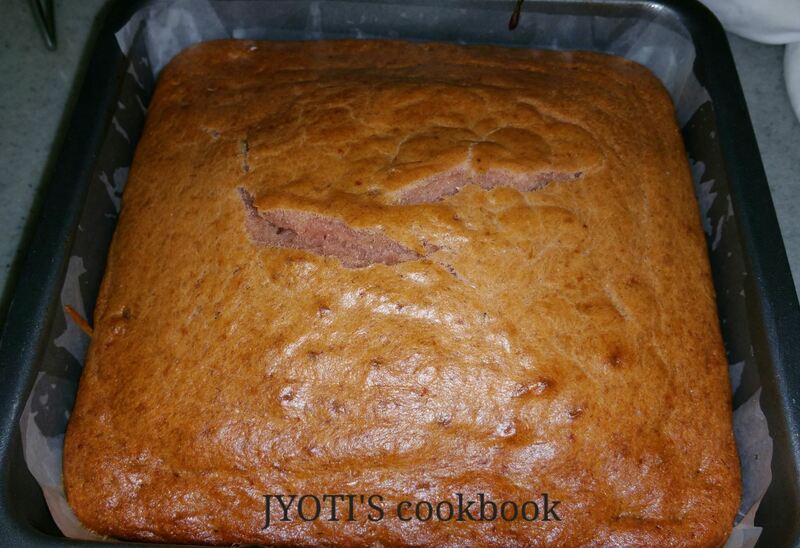 Ripe bananas can make a very yummy, light, moist and spongy Cake. This time, I have added goodness of chocolate, which gives the nice texture and taste to your taste buds. 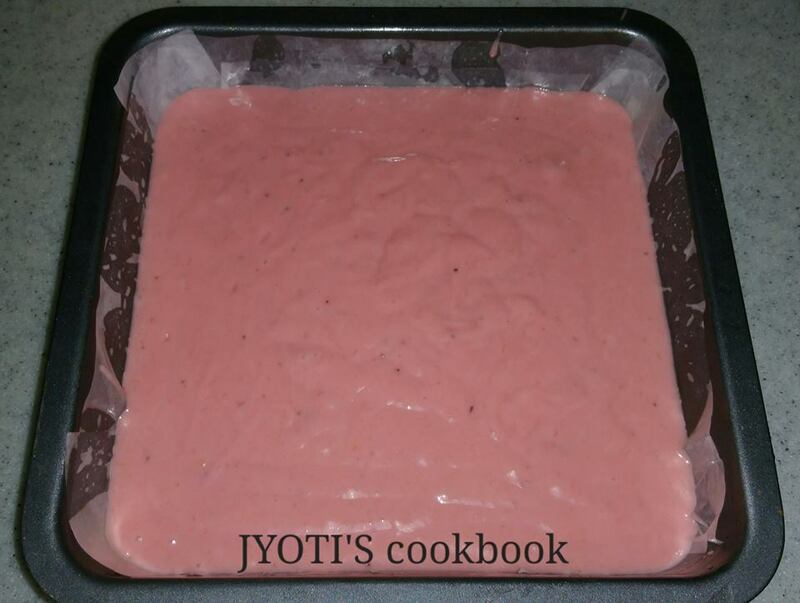 It is very easy to make and a very good snack for kids tiffin or can be accompany with a cup of tea.. .. Sharing simple recipe with you all..
You can use mixer grinder or hand blender to blend all the ingredients quick and easily. Peel and chop bananas and add it in to a blender and make a smooth paste. Add sugar, oil, water, lemon juice and vanilla essence. mix well. Sieve all dry ingredients. All purpose flour, cocoa powder, baking soda and salt. Now in a bigger bowl add dry ingredients into wet ingredients in a small batch. Mix with cut and fold method. Pour the batter and tap gently to remove air bubbles. Arrange chocolate chips on top. Enjoy.. cake with tea…yum yum…. 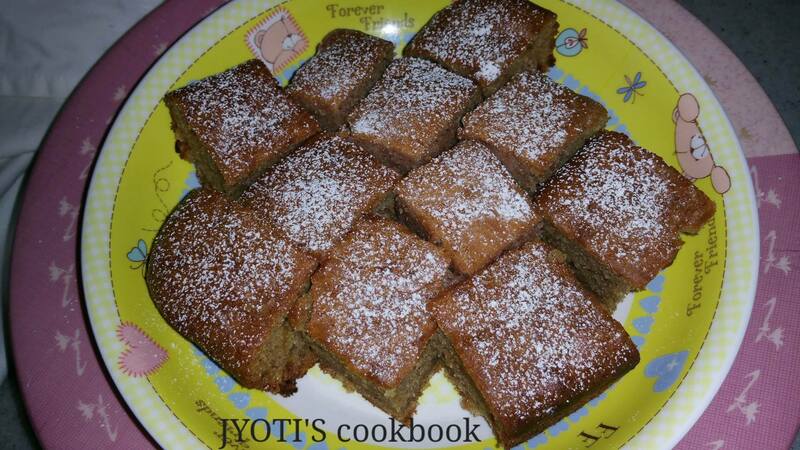 Ripe bananas can make a very yummy, light and spongy Banana Cake. A very ripe banana can be used as a substitute for an egg. It is very easy to make. It is a very good snack for kids or can be accompany with a cup of tea.. ..
Powder sugar for decoration only. Peel and chop bananas and add it in to a blender. Add sugar, oil and vanilla essence. Make a smooth paste. Sieve all dry ingredients. All purpose flour, Baking Powder, Baking Soda and Salt. Now in a bigger bowl add dry ingredients into wet ingredients in a small batch. Mix with cut and fold method. Add red colour drops. Mix well. Let it cool. Dust icing sugar.